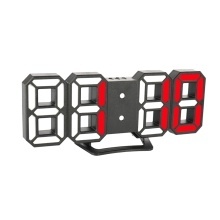 This multifunctional electronic clock can be placed on the tabletop or hung on the wall, more clear and beautiful, and it can be used during the day and night. Function: 12/24 hour format optional, calendar display, time display, alarm clock, snooze mode (3 groups of alarms, press any key to turn off the alarm and enter the snooze function), month display, temperature display, automatic adjustment of brightness in different time periods, or manual adjustment (3 levels of brightness can be adjusted), automatically enter low light mode at night. Built-in micro button battery, when power is off, the clock will continue to go, but the LED light is not on. Timing after power-on, no adjustment required. Can be placed on the table, and there is also a hanging hole on the back that can be hung on the wall. Suitable for study, public places, offices, bedrooms, living rooms, etc. The light is soft and does not hurt the eyes, it can be used clearly during the day and night.